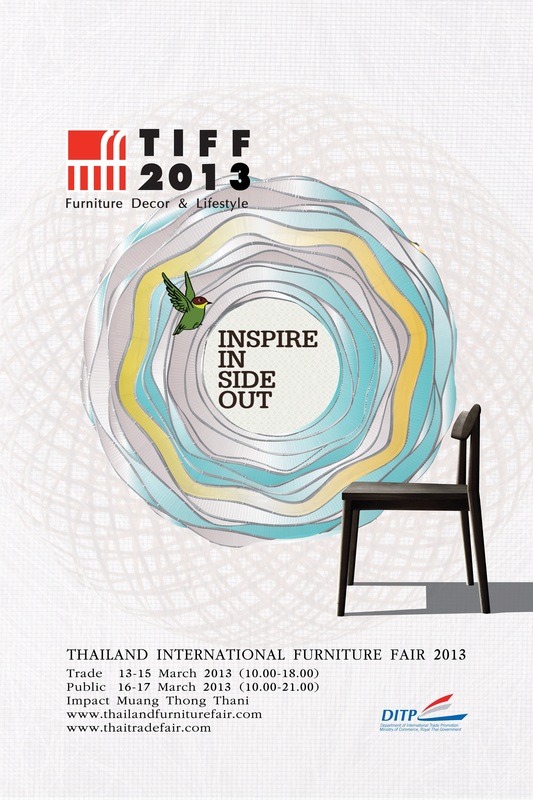 The Department of International Trade Promotion (DITP), in collaboration with, the Thai Furniture Industry Club (TFIC) of the Federation of Thai Industries (FTI) and the Thai Furniture Industries Association (TFA), have joined forces to present the 17th Thailand International Furniture Fair or “TIFF 2013”. The event is poised to become the grandest furniture exposition ever staged in Thailand, showcasing a most comprehensive and fascinating range of furniture items creatively designed and produced by top Thai manufacturers, all under the theme of “INSPIRE IN SIDE OUT”. This March 13th–17th, 2013, prepare to be amazed at a plethora of top quality furniture items of ingenious designs, and delight in great opportunities to establish relationships with high-potential business partners in the furniture industry from Thailand and beyond. According to Mrs. Srirat Rastapana, Director-General of the Department of International Trade Promotion (DITP), TIFF 2013 is expected to become an exceptional trade forum for all professionals in the furniture industry – covering manufacturers, entrepreneurs, designers or related operators (such as those in material and machinery businesses) to engage in direct discussions and negotiations in order to establish partnerships for the future. The first three days of the event, March 13th – 15th, will be Trade Days, opening exclusively for local and international businesspeople, while the last two days, March 16th-17th, will be Retail Days, opening to the general public. The event will take place at IMPACT Muang Thong Thani once again, yet the exhibition space will be increased to support a greater number of international visitors. TIFF 2013 is anticipated to welcome over 200 companies in 720 booths, a significant increase from 159 companies and 664 booths in the previous year. “Last year’s TIFF 2012 event was indeed an impressive success with more than 24,000 visitors from across the world attending. Additionally, another great exposition, BIFF & BILL 2013, will also be organized here during the same period so visitors can attend both quality events during the same visits, making TIFF 2013 all the more worthwhile and not to be missed," noted Mrs. Srirat. Under the concept of “INSPIRE IN SIDE OUT”, TIFF 2013 is expected to convey the competence of Thai furniture manufacturers who, apart from their proven expertise, can transform their inspirational ideas into real-life furniture that favorably responds to various consumer demands, whether in terms of design, materials, production quality and environmental protection. To stay up-to-date with latest developments on this fantastic 2013 event, please visit http://www.thailandfurniturefair.com or DITP Call Center 1169.